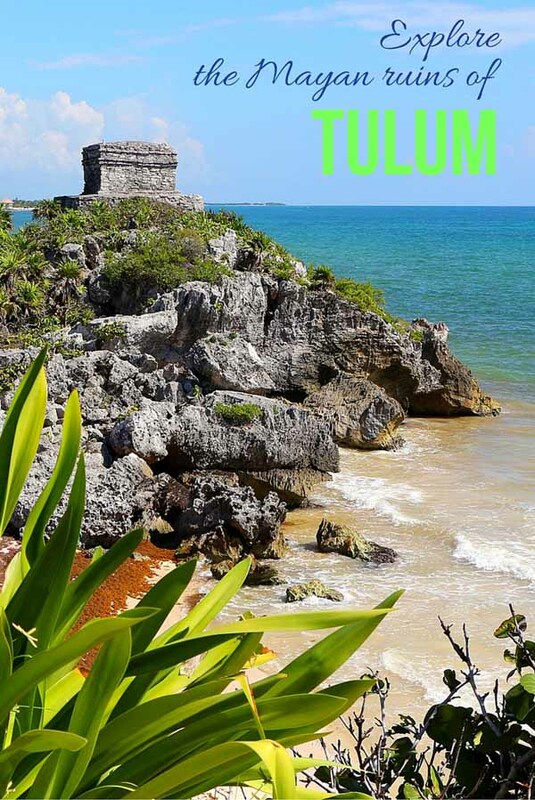 You’ve probably heard of the Mayan ruins of Tulum. Perhaps you’ve seen travel photos of Tulum’s iconic Temple of the Wind (shown above)? Beautifully laid out, Tulum may be the most accessible of the ancient Mayan cities you can explore in Mexico’s Riviera Maya. The Mayan founders of Tulum sure knew how to pick their real estate! Poised atop a 40-foot rugged limestone cliff, Tulum overlooks the turquoise Caribbean – it’s the only Mayan city ever built by the sea. The views are staggering. And steep stairs lead a long way down to one of the prettiest beaches you’ll ever see, with the whitest sand, where, yes, you can swim. The present archaeological site is a far cry from the crumbling Tulum ruins we traipsed about years ago. It’s been extensively restored since. Now gravel paths, lined by coral rocks, wind through manicured lawns. The monuments and buildings, many restored, are roped off. 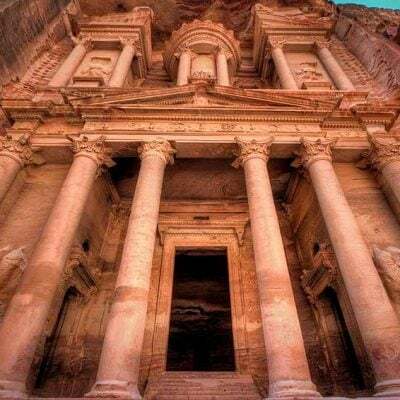 No more climbing up or trying to peek inside – preservation comes first! Here and there, a few trees also provide some shade, where you and fellow pink-skinned visitors may huddle around your guide (recommended, to fully appreciate this fascinating cultural marvel). But apart from these shady patches, the site is open to the blazing sun. 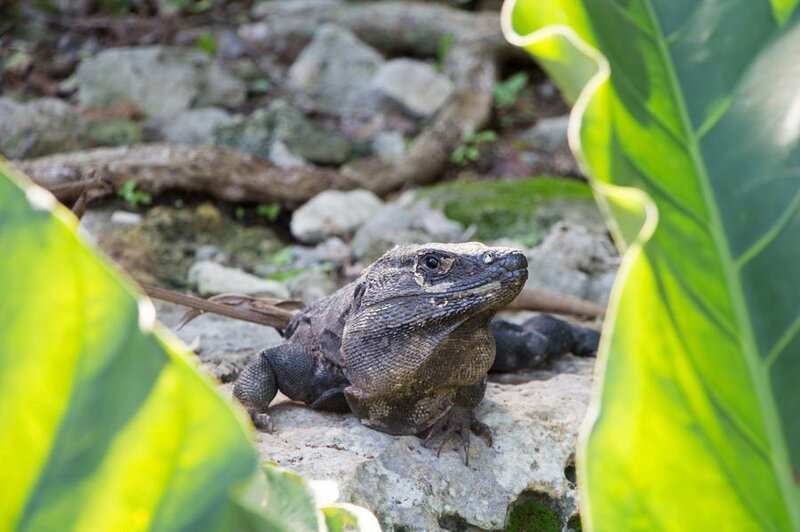 No wonder the iguanas love it! There’s a parking lot with shopping stalls too at the entrance. You can even take a little open-air train from the parking lot to the ruins! (Or, like us, you can just walk the relatively short distance). 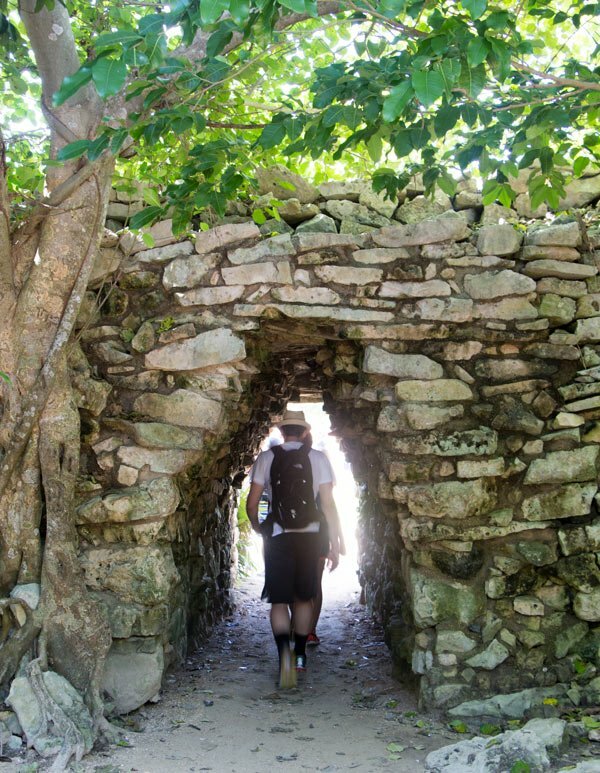 All of this means that the Mayan ruins of Tulum are much easier to navigate today. And with English signboards, you can even understand what you’re seeing without having to refer to your dog-earred Lonely Planet :-). We admit, though, that we missed the haunting wildness of the lonely ruins we experienced years ago (a little, anyway). Then, we felt like true explorers who had just stumbled upon mysterious ancient structures in a jungle clearing. The Castillo (or castle) is the building that really gets you gawking. It’s Tulum’s largest structure (25 feet high) and the one closest to the sea. The Templo de los Frescos (Temple of the Frescoes or Paintings) is also noteworthy. We couldn’t enter the inner temple to see the colored decorative murals inside (visitors are no longer allowed in). 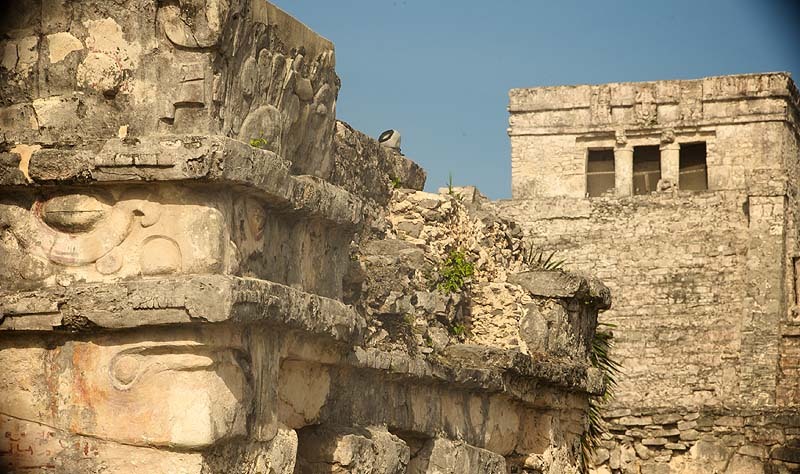 But on the outside walls, we could make out stucco reliefs of the “Descending God” (the main god honored at Tulum), shown as an upside-down figure. 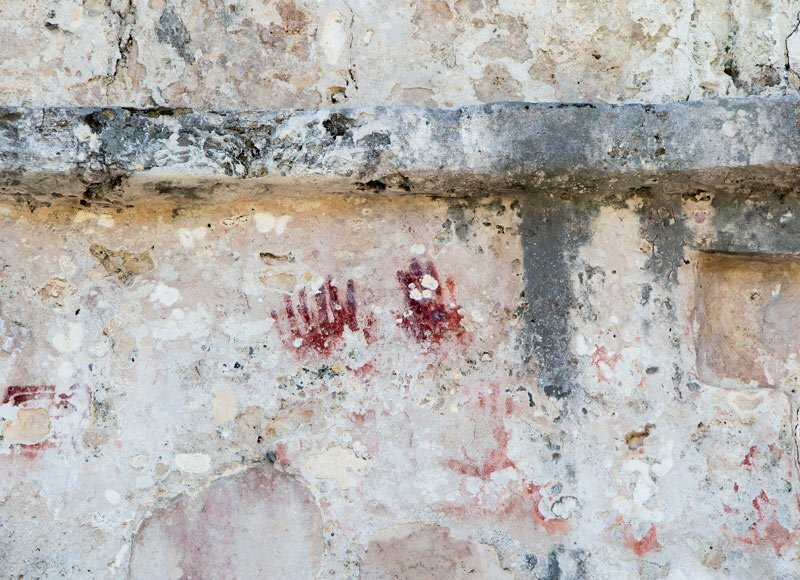 And looking closely, we also saw distinct red-colored handprints, original Mayan drawings, on the upper level. Okay, so much for the overall picture. Now, how about a few nuggets (some pretty offbeat!) about the ruins at Tulum and the people who lived there? 2) The Mayans started building the city around 580 A.D. Tulum reached the height of its glory between 1200 to 1500 A.D.
3) Only royalty and the higher classes (about 300 people) lived within the city walls, in limestone houses. Some 20,000 ordinary folk lived in thatched huts outside the walls. 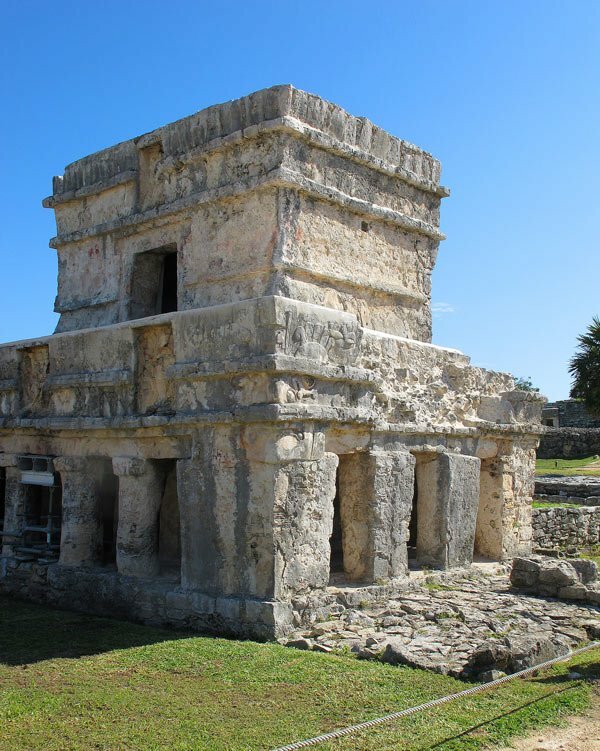 5) The temple buildings look sand- and grey-colored today, but would have been painted bright blue and red back when Tulum was a thriving city. 7) Tulum was built opposite a channel cutting through the Palancar Reef (the second largest coral reef in the world). The Mayans paddled canoes through the channel when transporting corn and other trade goods in and out of the city. Getting to the Mayan ruins: From the parking lot at the site entrance, you have to walk about a third of a mile to reach the ticket booth. Or you can hop on the tram that shuttles back and forth all day (20 pesos). Beware the sun! It’s hot and humid year-round, and the sun is intense. Bring water, and wear sun screen, a wide-brimmed hat and comfy walking shoes or sandals (flip-flops not recommended). No facilities: There are no biffies or change rooms at the ruins. So if you plan to swim at the beach, you’ll probably want to wear your bathing suit under your clothes. Time needed: Two hours for your visit (sans swim) is plenty to take in the site. 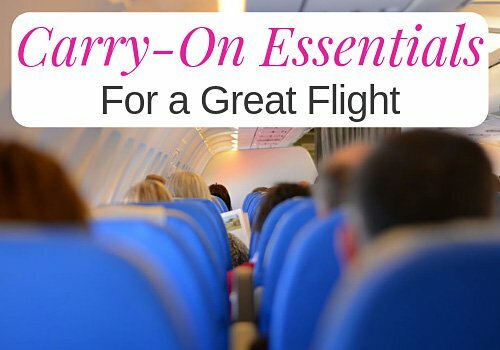 You’ll be looking to retreat from the heat after two hours anyway. Tulum ruins entrance fee: The entrance fee is 65 pesos (about the cost of a cappuccino, or $3.50 USD). 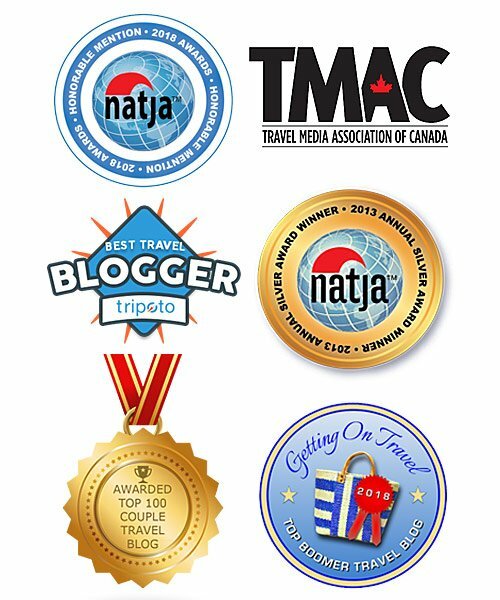 More information: See the Riviera Maya Tourist Board website. f you make a hotel booking on Booking.com through our site, we’ll earn a small commission – at no cost to you. Thanks! Cool off after your Tulum visit with a refreshing dip in a cenote! 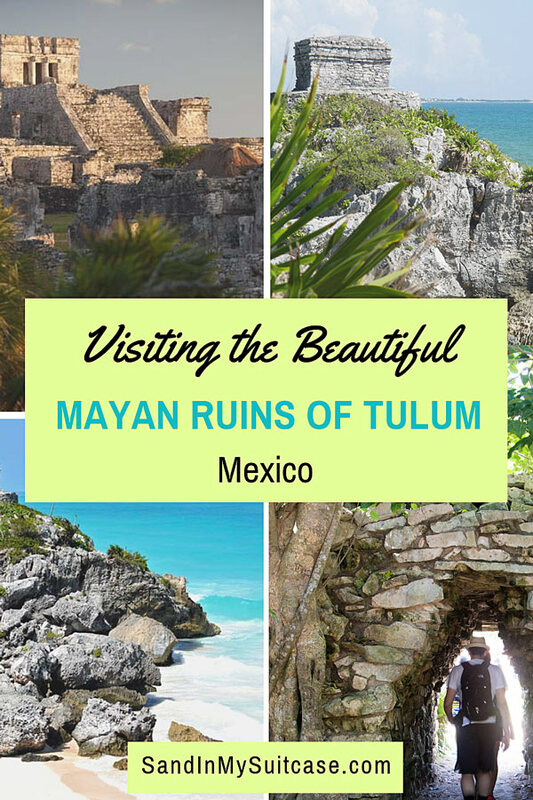 Have you visited the Tulum Mayan ruins? Are you glad you did? Love those ruins. So much history. They add another cultural dimension to visiting the Riviera Maya, don’t they? Thanks for such a wonderful picture and history post. My friend and I visited Tulum in 2011 and I took several pictures there. When I saw your picture showing the red hand prints I decided to see if any of the pictures I took of the Temple of the Frescoes showed that. I got so excited when I saw that my picture also showed them, but not as clearly as yours – I was farther away and hadn’t noticed them or I would have zoomed in on them. Thanks again. How fun that you found the red hand prints in your photos too! We had a guide who pointed out the hand prints — otherwise we likely wouldn’t have seen them either. It’s easy to miss the details when you’re so blown away by looking here, looking there, and taking in the overall picture! I find it strange to return to sites and experience the inevitability of change, for better or worse. Interesting facts there too guys, I bet they looked quite the sight rowing through the channel carrying corn with flat heads and sparkling teeth! Funny! Quite the image there :-). Looks great and the price of admission is, like you said, a cup of coffee. That’s ridiculously cheap for what you can enjoy. Hoping to visit this place one day. Thanks for the excellent tips. 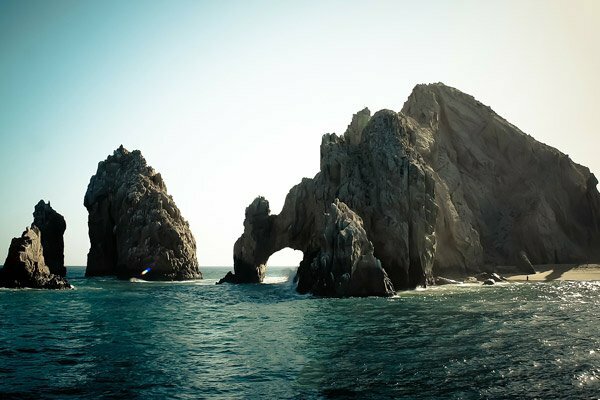 It’s a beautiful site – you won’t regret visiting! The setting looks almost as stunning as the ruins themselves. How things change and become touristy – I can relate when you describe how it used to be. One of the most beautiful memories I have is of visiting the Great Zimbabwe ruins many, many years ago…we had the whole place to ourselves (along with a bunch of monkeys). So rare to have an Indiana Jones experience like that today. I remember visiting the Riviera Maya region around 9 years ago and although we took a day trip to Chichen Itza, we didn’t make it to the Tulum ruins and now I wish we had done! The Castillo looks so beautiful! Chichen Itza is pretty special too! That’s a much bigger site though, and requires a full day to explore. 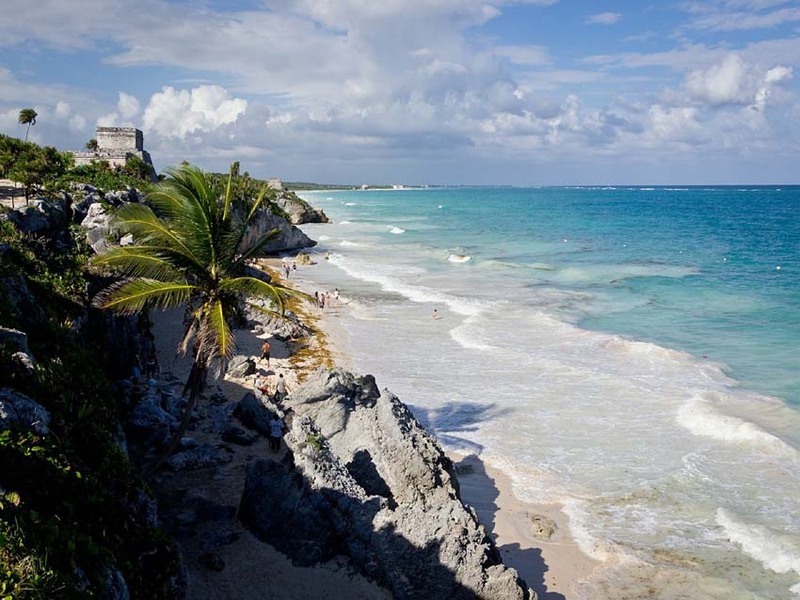 Tulum is also closer than Chichen Itza for most visitors to the Riviera Maya. 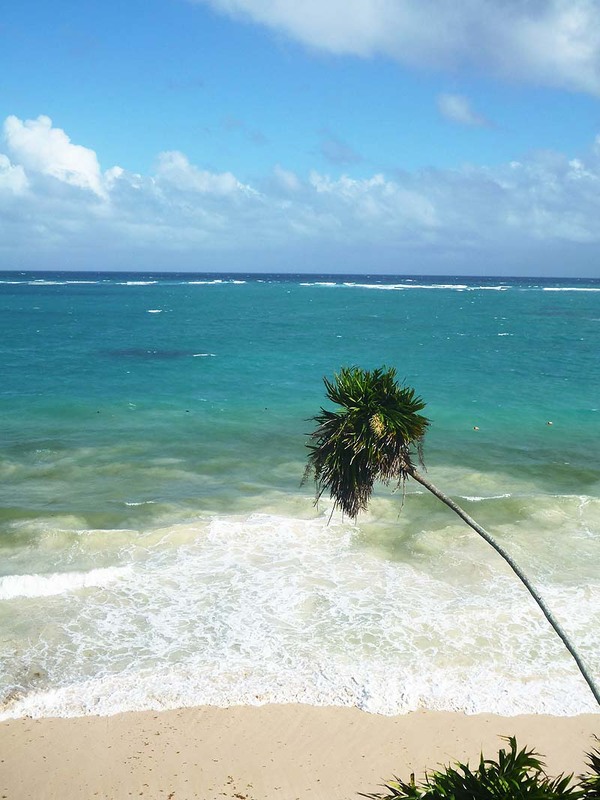 I hope to visit Tulum some day so thanks for these great tips and tbe big dose of inspiration! 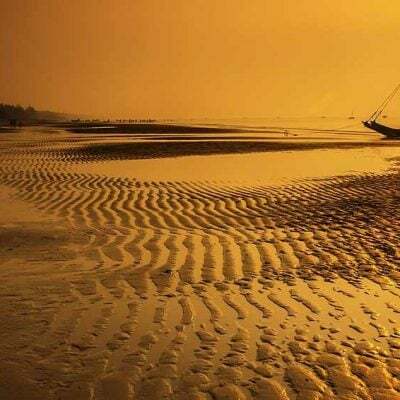 Seabourn Odyssey review: What’s luxury like on Seabourn Cruises?